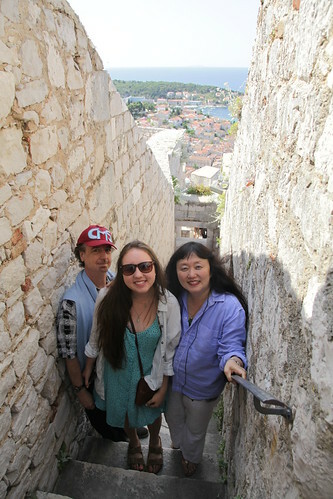 We arrived in Aspen on a beautifully sunny Saturday afternoon, excited as always but especially tired: we had left the CMS cruise in Dubrovnik the morning before. After flights through Zürich, New York, and Denver (with a hectic overnight at home) we somehow made it to Aspen in one piece. Waiting for us at 7pm that evening were the four ensembles from our Chamber Music Studio. 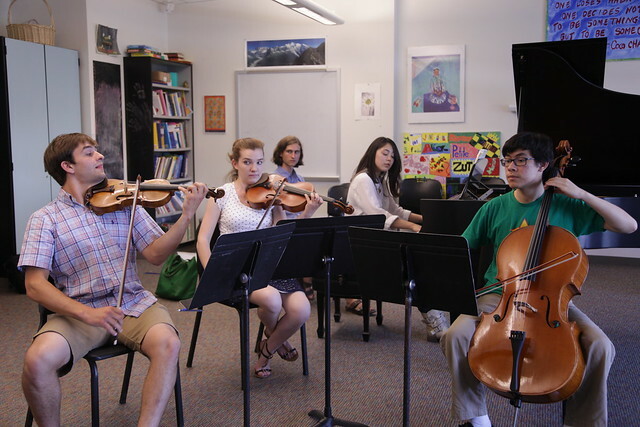 This special program, inaugurated by us last summer, serves four chamber groups comprised of Aspen Festival and School students. The students are selected by us through their festival applications, and each has specifically requested inclusion in our program. Already, this opportunity has become very competitive, and the final choices are tough to make. Once we have selected the players, we group them and assign them their repertoire. 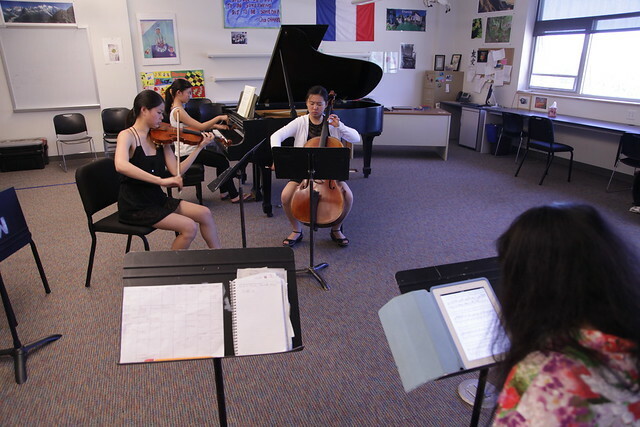 The four pianists and four cellists also study with us privately during the program. 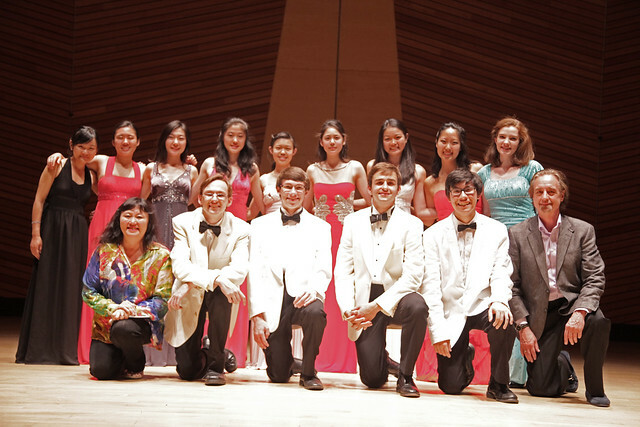 Joining us this year were pianists Adria Ye (who was in the program last summer), Carmen Knoll, Hewen Ma and Angie Zhang; violinists Will Hagen (also with us last summer), Julia Choi, Amy Blackburn and Fedor Ouspensky; violist Jossalyn Jensen, and cellists Sarina Zhang (with us last summer as a pianist), Zlatomir Fung, Erik Wheeler and Yin Xiong. The ensemble of Carmen Knoll, Will Hagen, Jossalyn Jensen and Zlatomir Fung tackled Dvorak’s beloved Piano Quartet in E-flat major, Op. 87, composed in 1889 just before his iconic “Dumky” Trio. 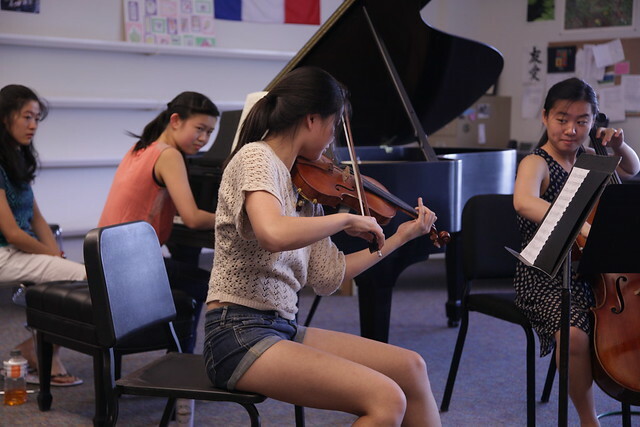 Adria Ye, Amy Blackburn and Sarina Zhang were assigned Brahms’s Trio No. 2 in C major, Op. 87, a robust work demanding full romantic sound coupled with classical style integrity, composed in 1882 when Brahms was forty-nine years old. 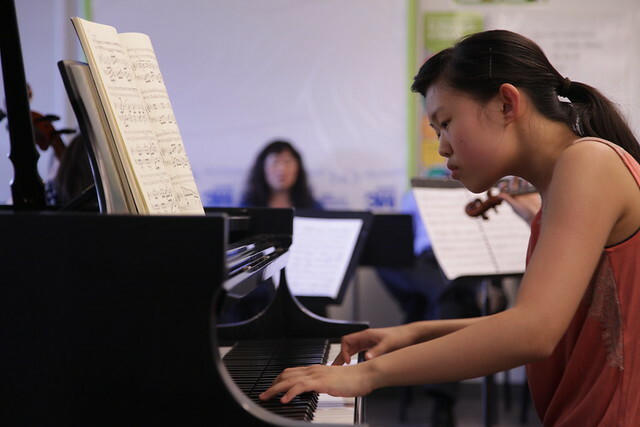 Angie Zhang, Fedor Ouspensky and Yin Xiong delved into Beethoven’s Trio in D major Op. 70 No. 1, known as the “Ghost”. This quirky, striking work is the first of Beethoven’s two trios composed in the summer of 1808 and published as Op. 70 in 1809. 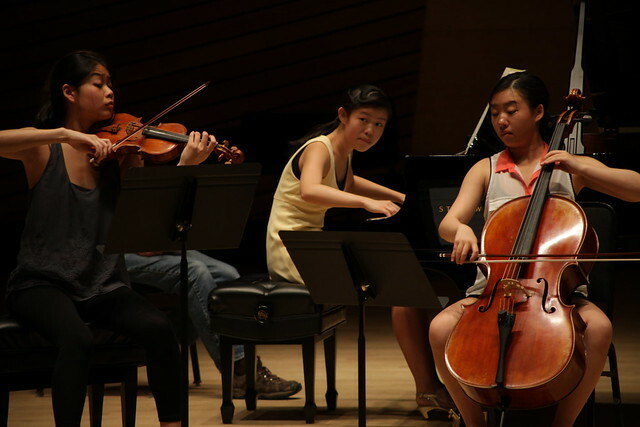 Hewen Ma, Julia Choi and Erik Wheeler were assigned Mendelssohn’s Trio No. 2 in c minor, composed in 1845 only two years before his untimely death. It is by far the more technically challenging and emotionally complex of Mendelssohn’s two piano trios. 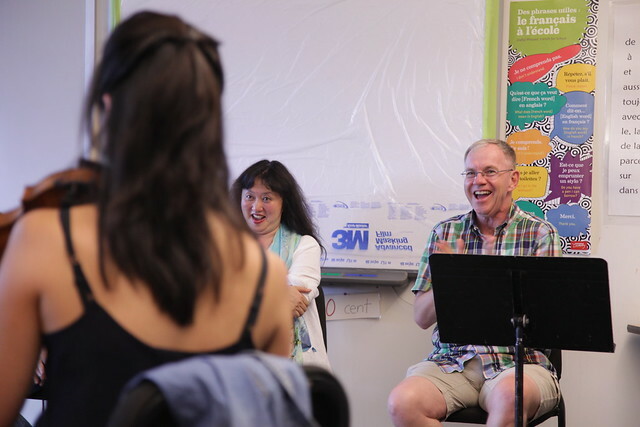 Our first session that Saturday evening allowed us not only to meet our students in person, but also to hear each group run through their assigned work from beginning to end. 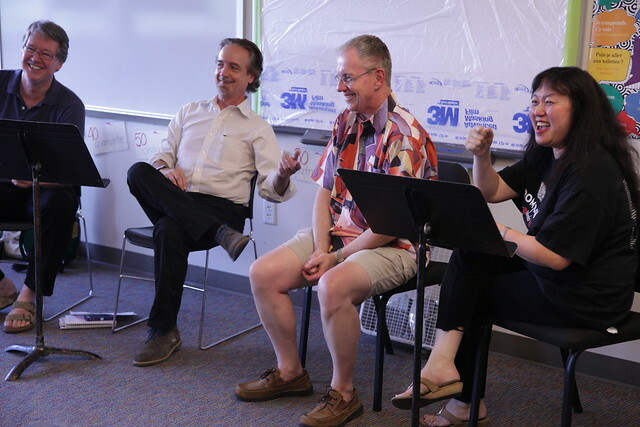 The fact that each of them could do so is not only a testament to their collective talent but also to early individual preparation and the three rehearsals each ensemble had had prior to our arrival. 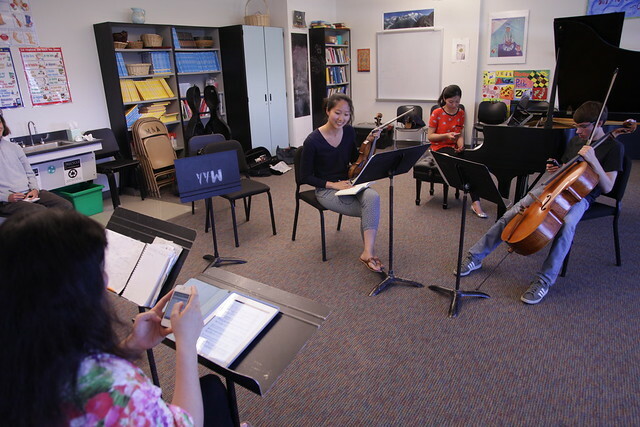 We knew, therefore, that the first two lessons of workshop had already taken place: one, always arrive at a chamber music rehearsal with your part learned, and two, solve as many problems as you can before taking your piece to your teacher. 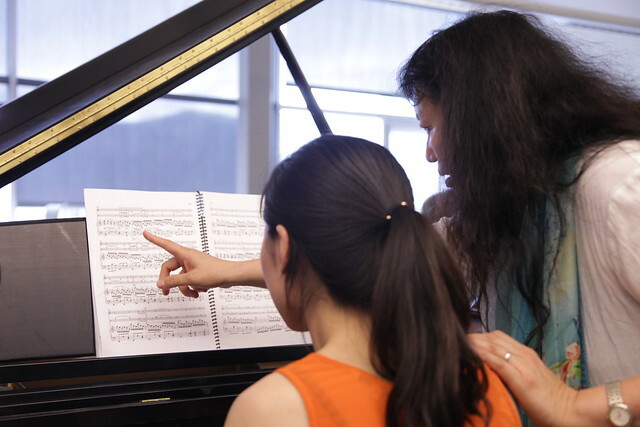 Although every group did well in their first performance for us, we made many mental notes on what each ensemble – and each individual – would need to accomplish in order to bring these great works to higher levels by July 14th, the day of the workshop’s closing concert. 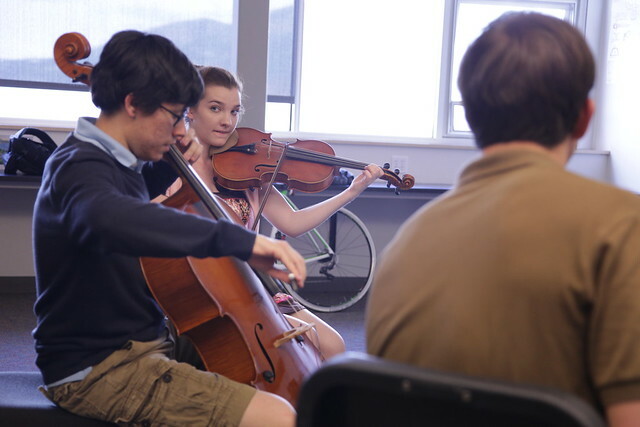 The Festival’s scheduled “chamber blocks” – times during the week when no orchestral rehearsals take place and therefore all students are free for chamber music work – provide no where near enough time for us to work at the level of detail necessary. 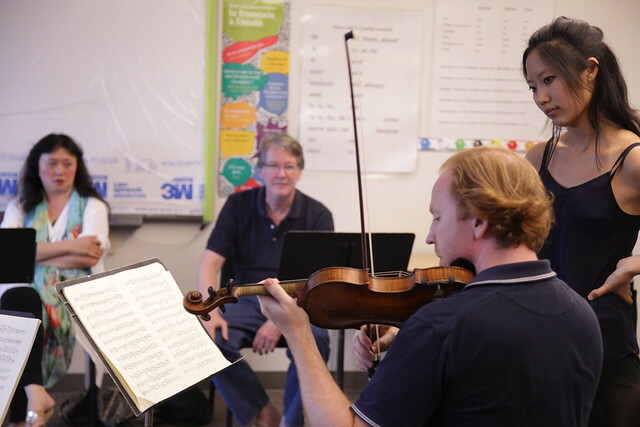 Our model for this workshop was inspired by our many teaching experiences in the Isaac Stern Chamber Music Encounters, during which ensembles received coachings at least every other day, sometimes lasting for several hours. All the cell phones came out, and group by group, we more or less tripled their expected coaching sessions. For the groups, it meant a lot more absorption in the pieces, and a fairly constant stream of input from us, often being reminded of habits that needed to be changed. 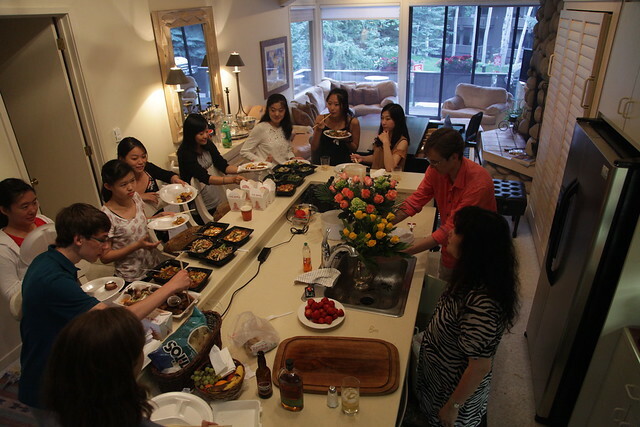 For us, it meant a much greater chance of hearing the results we were determined to achieve, albeit at the expense of hiking, playing tennis, swimming, socializing, and going to concerts – the activities most eager visitors to Aspen enjoy in abundance. 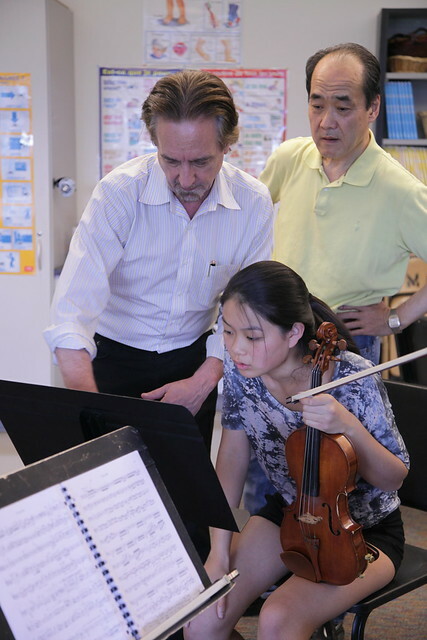 But Wu Han and I are simply not made that way, and as these incredibly talented young musicians put themselves in our hands, all our thoughts turned to helping them achieve their best, and to shaping the next great interpretations of their assigned masterpieces of chamber music. 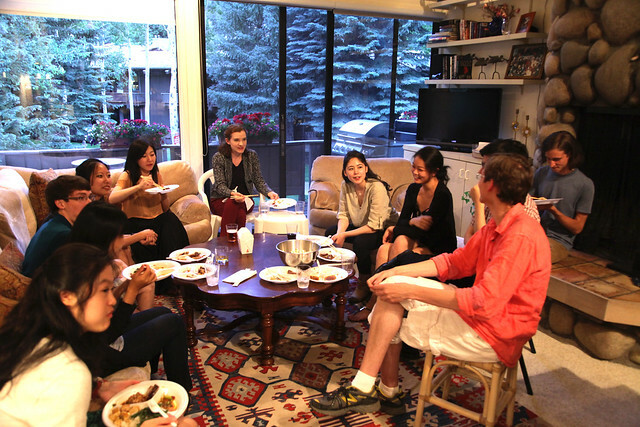 A good life in music, however, should not be devoid of life’s greatest pleasures, and, to that end, we invited our students early on to gather at our condo for Chinese food and a chance to relax and get to know one another. 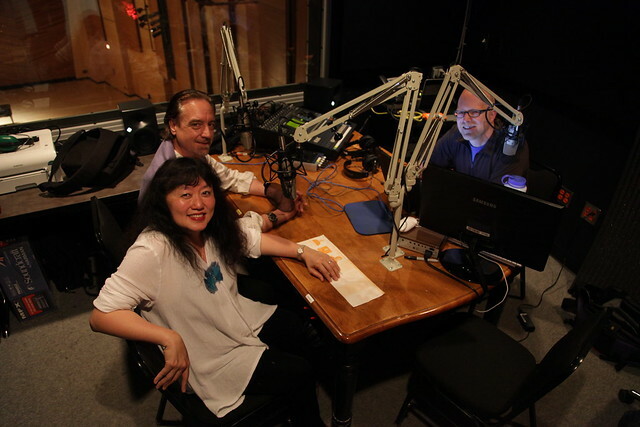 Wu Han and I also had other obligations, such as an interview on NPR’s Performance Today with our good friend Fred Child, held in the Irving and Joan Harris Concert Hall’s broadcast booth. We manage to catch up with Fred every six months or so, and there seem to be always new projects to discuss, as well as the music we have our fingers in at the moment. 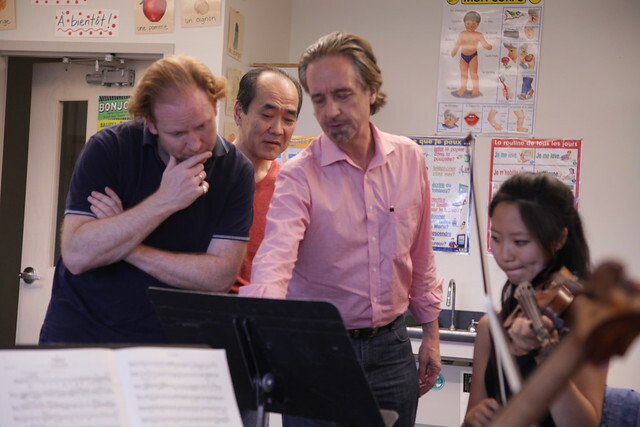 In this interview, Fred asked us probing questions about the essence of chamber music performance. 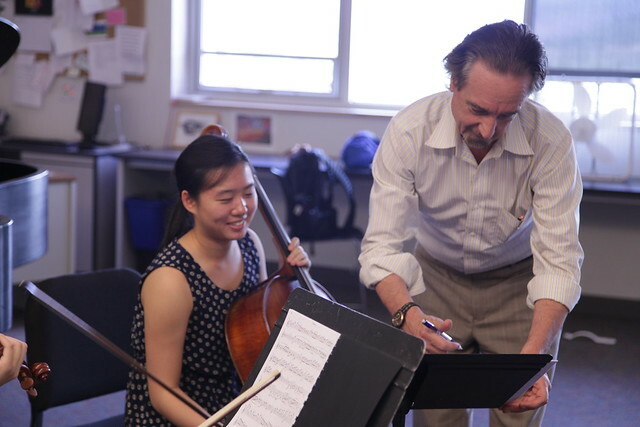 Fred is a great host, perhaps now America’s most familiar radio voice in classical music, and he’s earned that position through a combination of his very personal passion for the arts, his infectious enthusiasm and love of people, and an impressive knowledge of music. 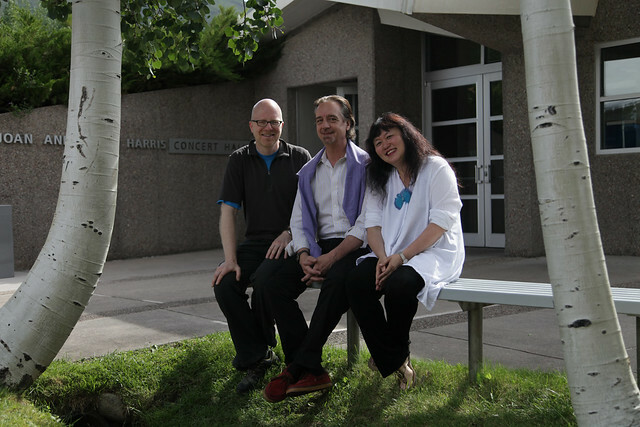 After our talk, we emerged into the glorious Aspen daylight for a portrait next to a babbling stream, in front of a concert hall that carries special meaning for us: I, with the Emerson Quartet, played the first notes in the hall during the summer of 1993 while the hall was still under construction, and Wu Han and I made the first recording in the hall soon after, of the complete Beethoven Sonatas and Variations, for ArtistLed. Moreover, we are fortunate to count Joan Harris and her late husband Irving among our most treasured friends. 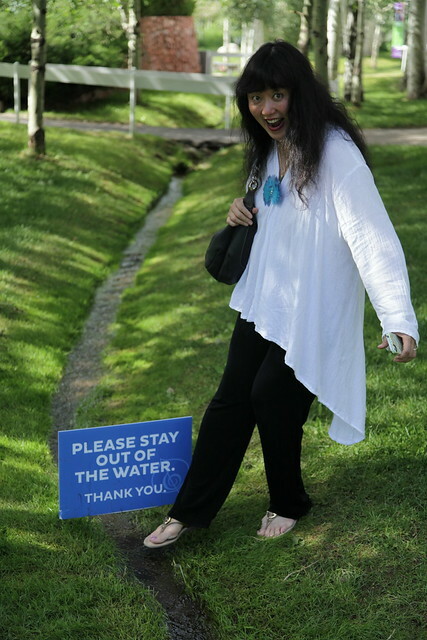 In between our closely-scheduled obligations in Aspen we always find time for some fun. 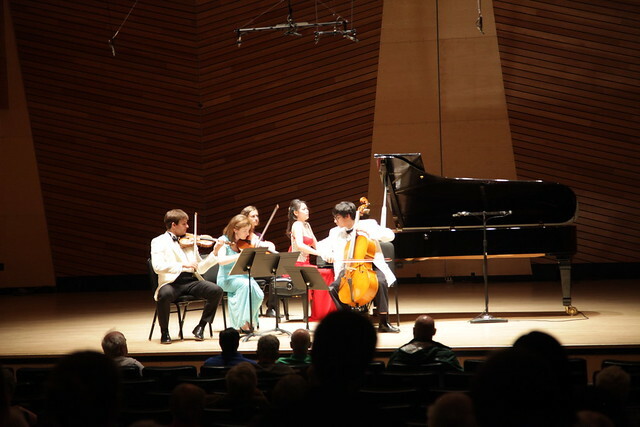 The very first days of our stay in Aspen also included a recital in Harris Concert Hall with violinist Philip Setzer, in which we performed some of our own favorite trio repertoire: Beethoven’s Op. 1 No. 2, Shostakovich’s Trio No. 2 in e minor, and Dvorak’s “Dumky” Trio, works we had been performing extensively during the prior season. 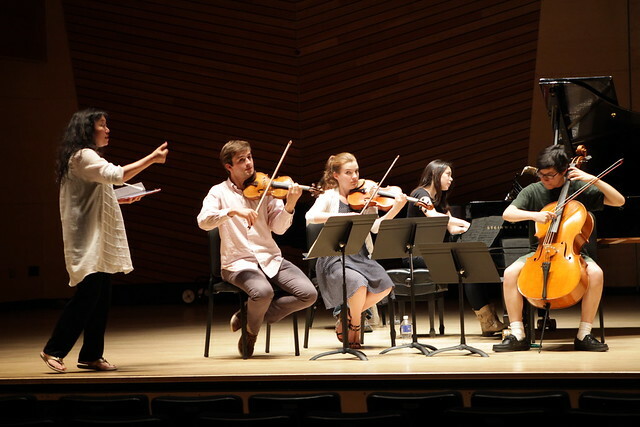 It’s always a pleasure to bring our best work to the discriminating Aspen audience, which includes not only astute music lovers but our students and fellow faculty and performers as well. 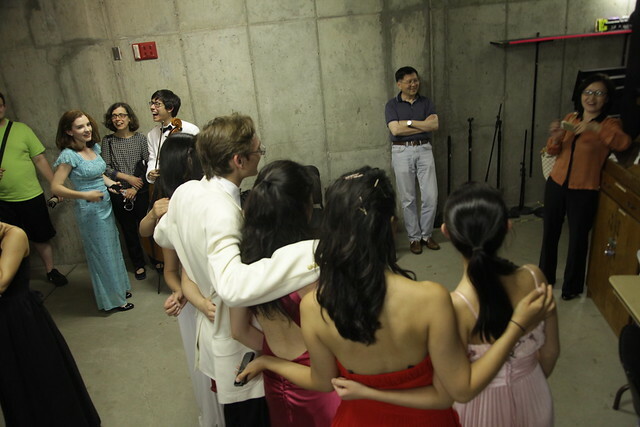 With that performance past, it was time for us to focus intensively on our young ensembles. 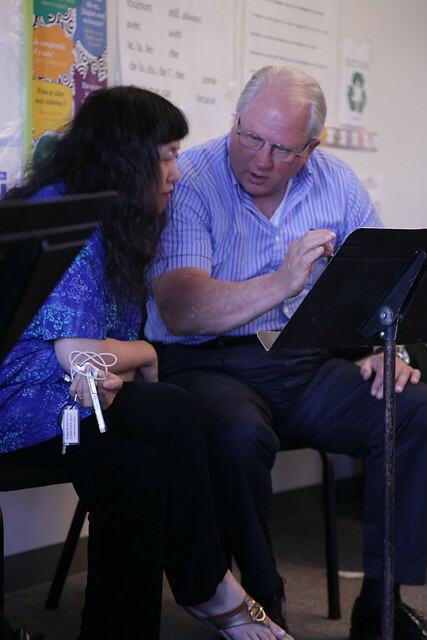 We are fortunate to have access to the distinguished faculty of the Aspen Music Festival and School, as well as guest artists, all of whom we invite to contribute their insight and experience in our coachings. 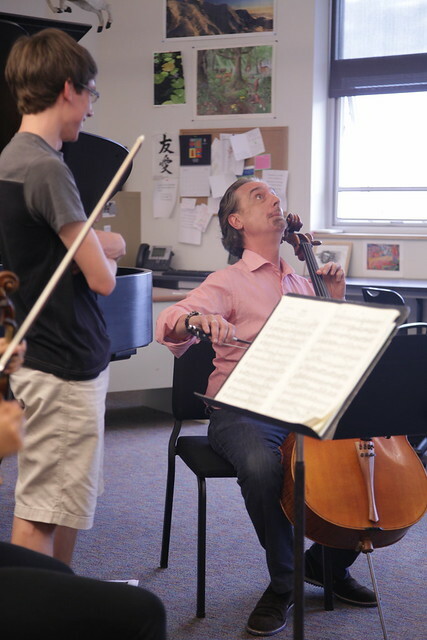 This summer, we were joined by violinists Masao Kawasaki, Robert Lipsett and Daniel Hope; violist James Dunham; and pianists Anton Nel and Rita Sloan, and you will see them at a work in many of the following photos. Each work studied in this workshop poses different challenges, and I’ll go through them one by one, accompanied by photos from our many sessions with each. Beethoven’s “Ghost” Trio is perhaps his most famous, undoubtedly because of its unforgettable name, which was not Beethoven’s idea but rather somehow got attached to it permanently. It is not inappropriate, however, as the slow movement is one of the most eerie in all of classical music. It is said that Beethoven was considering writing an opera on Shakespeare’s Macbeth at the time, and this seems perfectly plausible. What makes this trio so difficult to play are the incredible contrasts found within its three movements. Why Beethoven chose to write only three – after having written his Opus 1 trios with four movements each – is a mystery to us, but certainly we feel nothing is missing from this incredible work. The first movement is Beethoven at his most famously unpredictable: stopping and starting abruptly, alternately raucous and mysterious, jumping from one key to another. One can imagine the great composer totally high on coffee – his most famous addiction – his eyes popping from his head as they seem to do in several famous portraits. Beethoven demands a special kind of virtuosity of which we went to lengths to explain, and this presents huge challenges for us performers: his music is often composed neither to feel comfortable nor even sound comfortable. We instinctively strive to make music in a natural way, but so often with Beethoven, the dynamic and tempo markings he insists on, let alone the notes themselves, are almost impossible to execute. But the lesson here is that Beethoven was a composer and a human being for whom struggle and conquering were the essence of life itself. We are convinced that these qualities are what connect his music so powerfully to such a huge audience. I personally find Beethoven the most human of all the composers, the one I can relate to most immediately, and for sure, my first choice to meet if I could journey back to his time. The slow movement is, for me, one of the most difficult pieces to play in the entire chamber music literature. Some of the hardest works I’ve played – the Bartok String Quartet No. 5, the Korngold Quintet – I promise are easier for me. Not that they are easy, but they are more conquerable than this single page, which looks so simple on paper. Such are the wonders and joys of great music! The slowness, the tension, the mystery, the frightening outbursts combine to produce a movement of unsurpassed drama. Probably, this movement required as much coaching time as its other two movements combined. The finale is a joyful race of relentless energy, the strings exchange fragments of melody accompanied by blindingly fast scales, arpeggios and passagework in the piano. 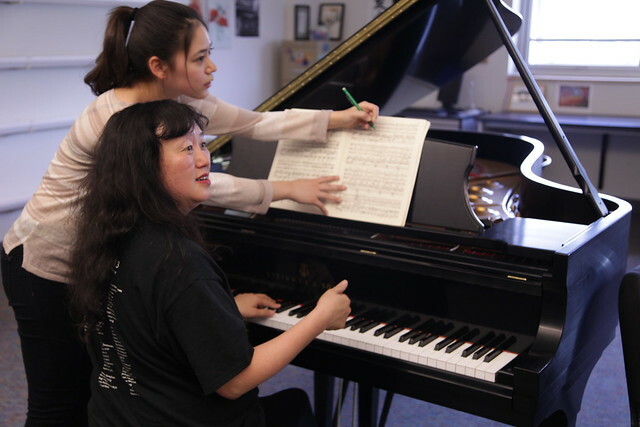 Angie Zhang (who during our workshop performed as winner of the festival’s Mozart Concerto competition) performed her demanding part with great virtuosity, supported by lots of attention from Wu Han. Moving along chronologically, the next piano trio in our program of chamber music masterpieces was Mendelssohn’s Piano Trio No. 2 in c minor, composed when he was thirty-six years of age, six years after he completed his first trio. Like the first trio, this is a turbulent, four movement work that makes enormous demands on the performers. Mendelssohn was one of history’s most prodigiously gifted musicians. A child prodigy in a class with Mozart, he was composing some of his finest music by the age of sixteen. He played the violin well enough to lead orchestras, mastered ancient languages, knew philosophy and literature well enough to converse with Goethe, was the finest organist of his time, founded the Leipzig Conservatory, and the list goes on. To say that nothing was difficult for Mendelssohn would be something of an understatement. The enormity of his talent is reflected not only in the genius of his compositions but also in the difficulty of his piano writing. What was probably child’s play for him represents hours and days of patient and methodical work for even the most accomplished pianists of our time. 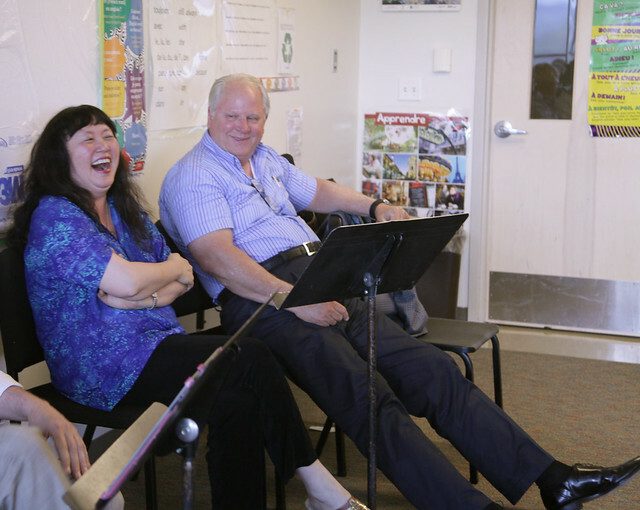 It therefore fell on this trio’s pianist, Hewen Ma, to not only learn her notes thoroughly (which she did) but also figure out how to balance her extreme number of notes with the two string parts, something only the most experienced, sensitive and accomplished pianists can do. 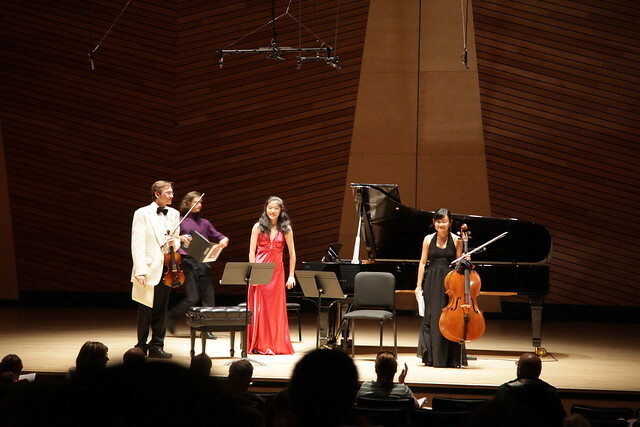 Fortunately, Hewen had two players of tremendous capacity as her partners: violinist Julia Choi and cellist Erik Wheeler. For them, it was a challenge of projecting their parts with passion while at the same time maintaining Mendelssohn’s exquisite sense of taste and respect for classical sensibility (Mendelssohn is considered a true connector of the Classic and Romantic ages in music). 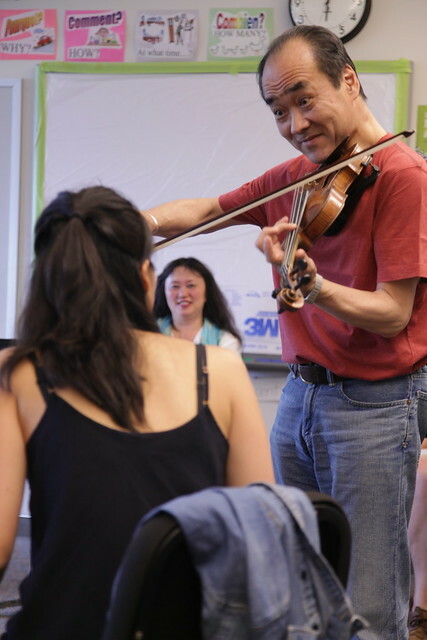 Doing so, for the string players, meant many things: working on sound production, down to the tiniest details of vibrato; ensuring that the fingerings and bowings for literally every note of the work were optimal; knowing how soft one can play when called for; and looking very carefully at the composer’s markings. It was wonderful to witness how this work grew and blossomed in their hands, from an already-impressive run-through the first day to a glowing, touching interpretation that had the audience on its feet instantly at their final performance. 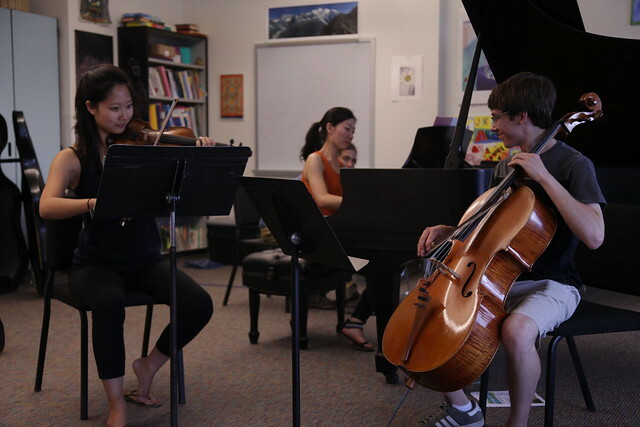 Next on our program was the Trio No.2 in C major by Johannes Brahms. Brahms composed three piano trios, and, as he never let anything escape his desk that didn’t meet his standards, each one is a true masterpiece of the chamber music literature. The C major – as its key implies – is by far the most joyous and free-spirited among the set. 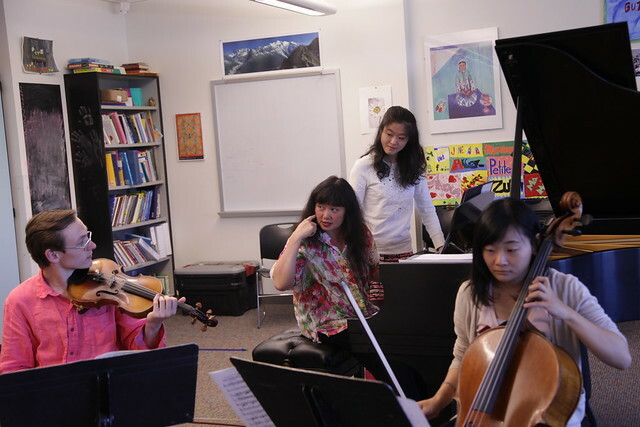 Our extraordinary ensemble for this trio consisted of Adria Ye, pianist, Amy Blackburn, violinist, and Sarina Zhang, cellist. It is sometimes said that one has to become of a certain age before being able to play Brahms easily. I do believe that to some degree this is true, especially in the case of a composer whose music embodies the effects of profound life experiences, heavy responsibilities, and in Brahms’s case especially, an uncompromising, un-frivolous nature. Our young and vivacious trio presented us initially with a fleet-footed, transparent interpretation, which immediately prompted all kinds of visual imagery from us: the enormous, slow-moving, pot-bellied, beer-drinking and sausage-eating Brahms, sitting in Vienna’s famous Prater enjoying the food, the folk music, and enjoying the scenery. It’s easy to ask people to play faster, slower, louder and softer, and to do all manner of things instrumentally, but unless the musician’s own imagination is engaged, unless a sound or idea is conceived of by them, then the information doesn’t really become a part of them. This trio had no problem playing the notes, but needed to get themselves into that very special Brahmsian world: his deep connection to Beethoven, his affinity for Hungarian music, his respect for “absolute” music that needs no stories to help it (Brahms never wrote “program” music like Strauss or Liszt). Yet, this trio has wonderful moments which are carefree and should bring smiles to our faces. The weight and thickness of the “Brahms tone” (as one might call it) demands special work from both string players and pianists. 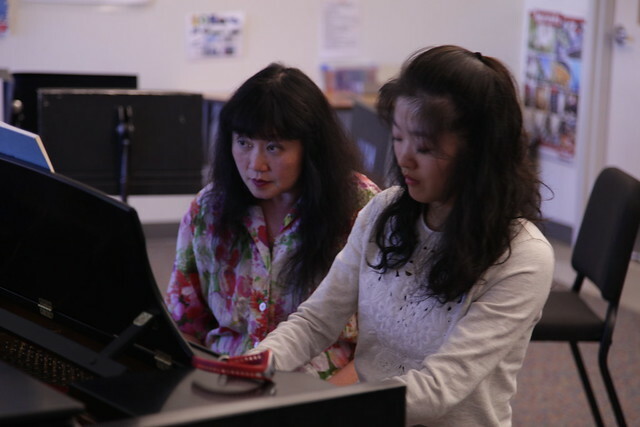 For pianists, it has a lot to do with posture, voicing and pedaling (as I learned from listening to Wu Han and her pianist colleagues talk). And for the strings, it has much to do with developing a rich, healthy vibrato, and often slowing the bow so as to extract the maximum resonance from the instrument by playing close to the bridge (the “sounding point” in violin language). But of course, those sound qualities must be in the imagination of the performer in order to happen. Eventually they can happen, once a musician has heard themselves make the right sound enough times to recall and reproduce it. Brahms also requires special rhythmic integrity: you can’t play his works with the abandon or whimsy required of his mentor Schumann, for example, so one needs to combine for Brahms the strongest structures of the Classical style with the sensuousness of the Romantic era. And we must say: this ensemble totally absorbed what seemed for them to be a new interpretive ethic, so much so that by the time of the performance they truly owned the piece. We were astonished, delighted, and very proud of them. And finally, our concert ended with the magnificent Piano Quartet in E-flat major by Dvorak. Composed in 1889, only a couple of years before his departure to America (to lead the National Conservatory) this piano quartet is Bohemian to the core, with an occasional nod to Brahms and the elegance of Vienna, especially in its waltz-like third movement. 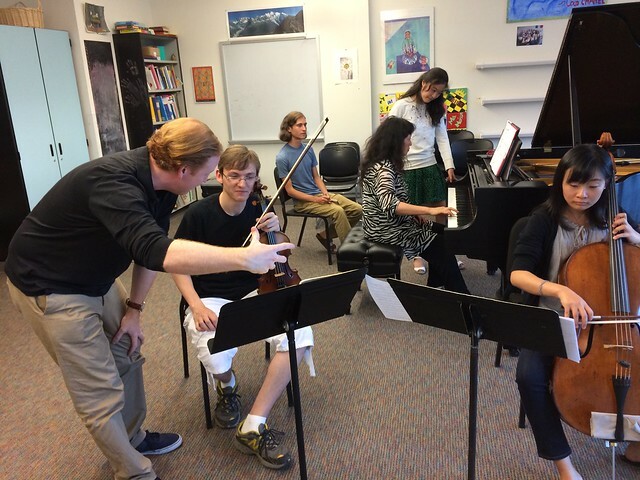 Our group was populated with known quantities, high recommendations, and complete surprises: Will Hagen, the wonderful violinist who last year performed Dvorak’s Dumky Trio in our program, returned for yet more Dvorak, bringing with him his great spirit, eagerness and instrumental talent to burn. Highly recommended was violist Jossalyn Jensen who proved herself quickly with expert ensemble sensibility and a soulful sound perfect for the piece; cellist Zlatomir Fung was sent to us by his teacher, the already-legendary Richard Aaron, with the highest praise, and this extraordinary young cellist lived up to every expectation; and pianist Carmen Knoll, a last minute replacement for an injured Fei-Fei Dong (who has since recovered), was a great discovery for us all. A natural pianist and musician of extraordinary ability, she seems born to play music and is a totally captivating young artist. The Dvorak Quartet is one of chamber music’s most popular works, and with that kind of familiarity, every group has to simply try to outdo the last one that played it. I have run my own performing life just that way (and had my expected share of disappointments and frustrations) but that kind of striving – especially for such talented young people – is a healthy thing, as you are really only competing with yourself. If you set your expectations higher than anyone imagines, you are more likely to please the majority, even if you feel you fell short. When playing any over-the-top Romantic era work, one has to be careful not to become so excited as to lose perspective and control. If anyone should lose control it should be our listeners! So with this ensemble we worked carefully on, for example: the gradation of crescendos to achieve maximum impact; the subtleties of vibrato and color that can touch peoples’ hearts; and the judicious balancing of the instruments so that everything could be clearly heard even in the most complex passages. In addition, each movement of this marvelous piece has a different character. The first is exuberant and serious, classically constructed perhaps the most like Brahms of any in the piece, and benefits from a steady tempo. 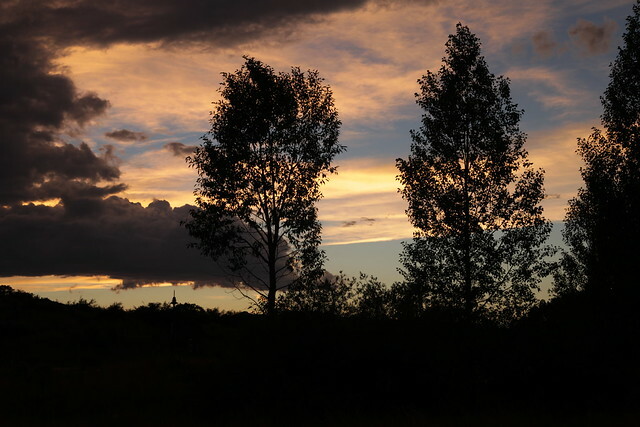 The second is peaceful love song, intoned by the cello, interrupted by two turbulent storms. It’s a perfect depiction of many real-life relationships, and one of the most touching pieces Dvorak ever wrote. The third movement is a like a waltz-fantasy, with touches of exotic, Middle Eastern-style melodies, and a middle section, announced by a buzzing tremolo in the viola, that turns into a very wild ride. After a welcome recapitulation of the opening waltz, the movement concludes with a soulful cello statement. The finale is a vibrant peasant dance, in a stormy minor mode, which soon breaks into the sunshine with a loving, major-key second subject, and, for good measure, Dvorak throws in an additional theme to close the exposition in which both violin and viola soar to impassioned heights in truly memorable fashion. 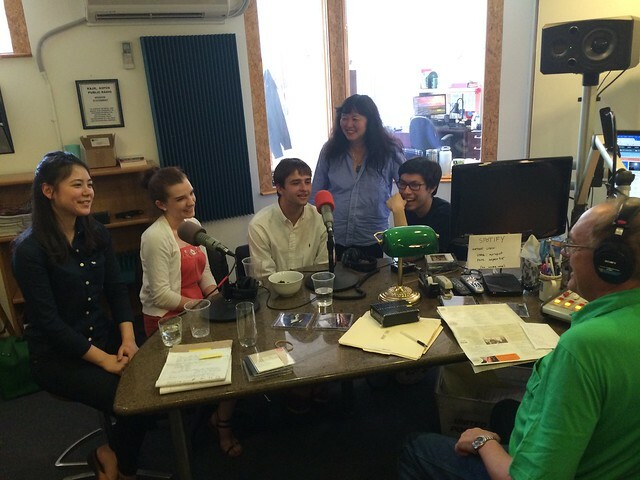 During the week prior to the performance, we brought this Dvorak ensemble to be interviewed on Aspen Public Radio by host Chris Mohr. Chris expertly drew out their thoughts on the workshop experience, and it was fun for us to take a step back and hear, for the first time, what they have learned. 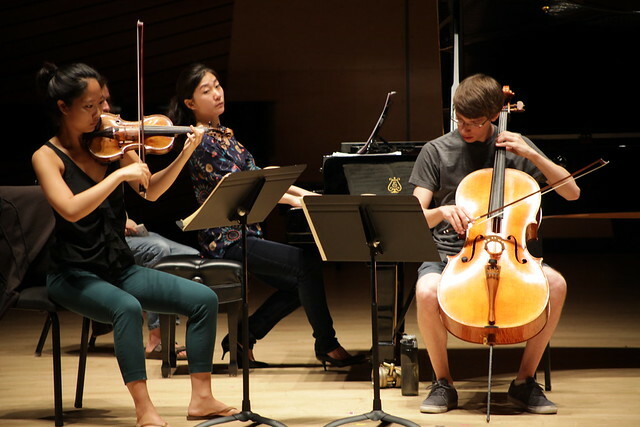 In addition, Wu Han and I also presented a master class in Harris Concert Hall – always part of our Aspen residency – where we worked with three cello-piano duos on sonatas by Debussy, Brahms and Rachmaninov. Before we knew it, the final concert was upon us. 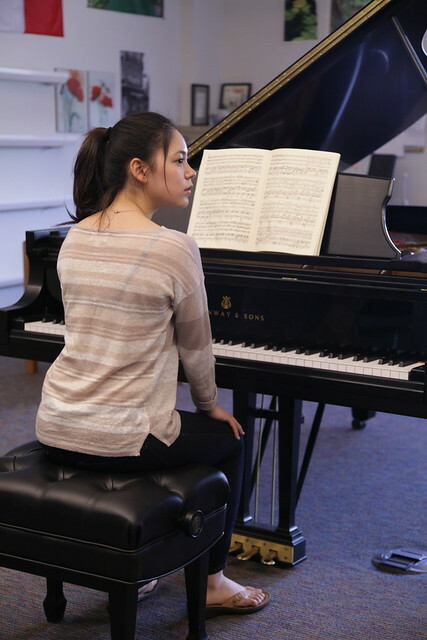 Because of the intensity of Harris Concert Hall’s schedule, we had to have a separate dress rehearsal for each ensemble – not ideal, but we managed. The dress rehearsal in the hall is perhaps the most important session of the program, for it is only then that the real balances, tempi, articulations and other details can receive their final adjustments. And there were many, which is as true for seasoned professionals as it is for students. In general, a hall with good resonance like Harris Concert Hall requires judicious control of the loud playing (sounds can easily swell to huge proportions) clear diction like any good actor or speaker, exploring the minimums (sometimes it’s difficult to play soft enough) and simple matters of stage presence and behavior. 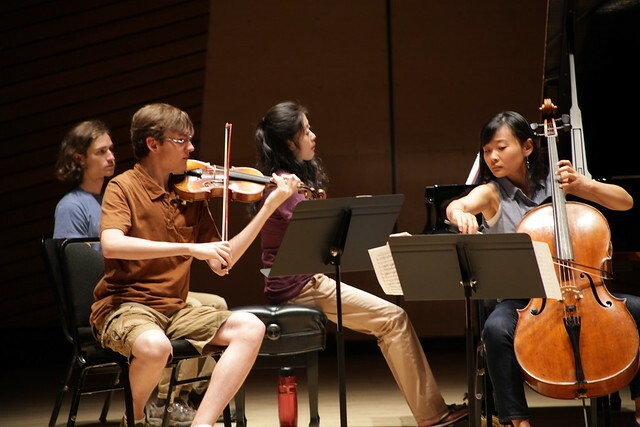 Part of our training for young musicians – in Aspen, Music@Menlo, Chamber Music Today in Korea and elsewhere – includes simply walking on and off stage and bowing properly. There are always ways to improve one’s appearance, body language and subliminal messaging. The concert came together beautifully. 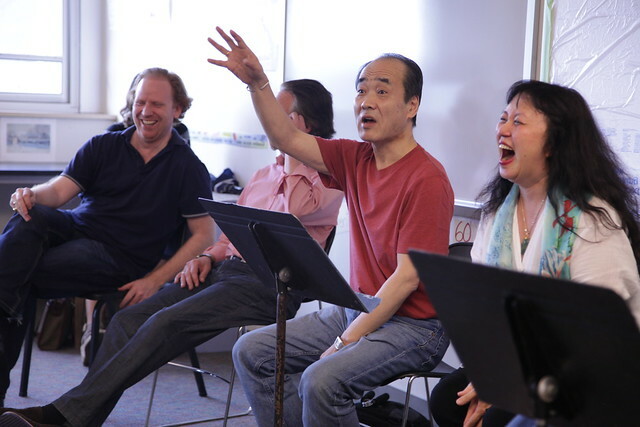 Our ensembles played with great intensity, precision and awareness, and Wu Han and I sat in the audience remembering how they first sounded and marveling at the transformations these musicians and their interpretations had made over such a short time. We were very, very proud of them. 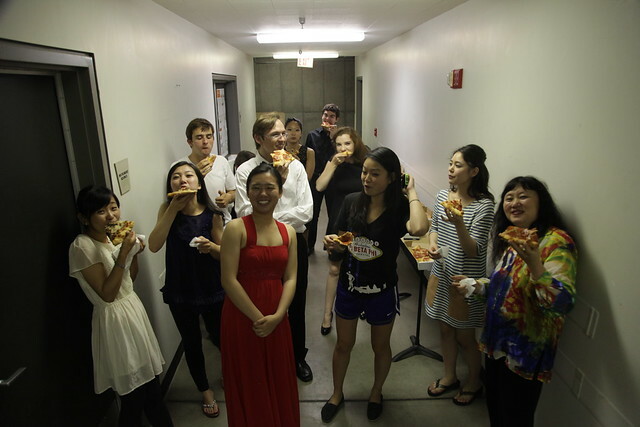 Afterwards we treated our graduates and their friends and families to a backstage pizza party. There was much hugging, laughing and endless picture taking. We’ve all left this powerful experience with many wonderful memories. I hope I’ve captured a good portion of them in this blog, and I hope my readers get a sense of what a privilege it was for me and Wu Han to be part of this program. 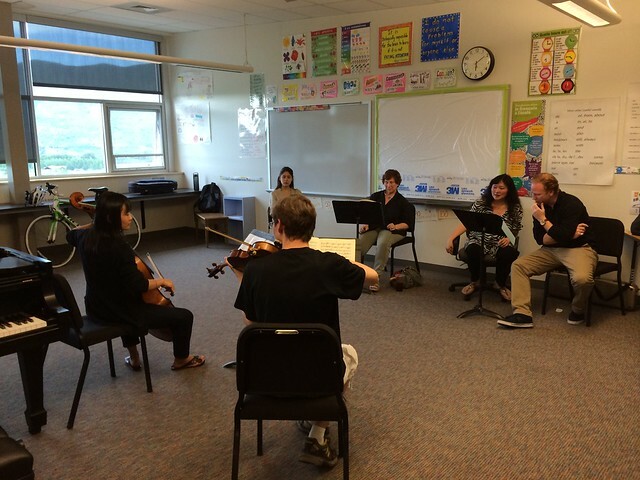 Our thanks go out to the Aspen Music Festival and School for making this possible. Many administrators worked with dedication, precision and passion towards the success of this project, and we look forward with excitement to unfolding another incarnation of this extraordinary program next summer.